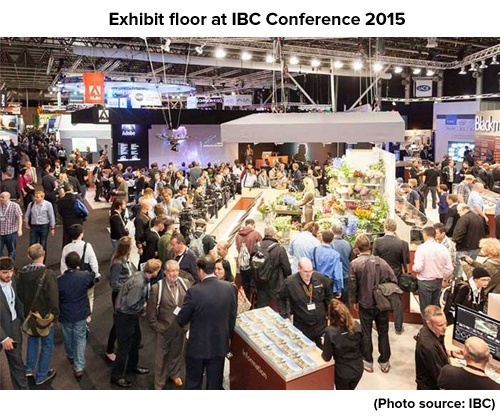 Earlier this month I had the pleasure to attend IBC2015in Amsterdam. This year’s conference attracted a record-breaking crowd of 55,000 attendees from over 170 countries, representing a broad range of broadcast, telecom and IT companies. If you want to learn more about the hottest trends across the creation, management, delivery and monetization of content across connected devices and new media, this is a great event. It was exciting to attend IBC as a representative of Lynx Technology, which recently acquired the European and North American operations of PacketVideo. As part of the acquisition, Lynx Technology was granted license to Twonky™, the industry’s leading media connectivity technology platform since its launch in 2004. As was the case at the IFA conference held one week earlier, a key focus at IBC was the smart home. A variety of smart home integration use cases were showcased by different set-top box (STB) manufacturers on hand. Whether the goal is to control the alarm system, the utilities (lights, heating, cooling) or even landscaping tasks, it is clear the STB will control far more than just digital content in the smart home. At other booths, it was interesting to see those companies showcasing their virtual reality (VR) capabilities. The immersive experience using the VR glasses provide exciting new ways to interact with digital content found on television, computers, smartphones and tablets. IBC was a great opportunity to speak with the technology providers and manufacturers on the future of premium content, the continuing need for secure services and sharing, as well as to get into the entrepreneurial spirit speaking with mobile app developers and providers focused on premium content. Content is anywhere and everywhere, and Twonky is the best media connectivity solution for new players and digital devices. Beyond seeing what the industry is doing today and what’s ahead tomorrow, IBC is a great place to see the wide variety of participants in the media ecosystem. I enjoyed introducing Lynx Technology as the new name for our now privately-held company. Overall, IBC was a great event and I look forward to seeing where the industry will be 12 months from now at next year’s event. I have no doubt it will continue to be an exciting adventure with even more development and momentum to be gained, especially when it pertains to the smart home.